I’ve been writing a lot of WMI scripts lately. Indeed, for a while there it seemed as if “Scripting for MCSEs” was becoming “WMI Scripting for MCSEs.” There’s a reason for that. Quite simply: power. Pure, unadulterated power! It’s odd that something named Windows Management Instrumentation (a seemingly benign title) could pack such a wallop, but it does. Truth be told, WMI makes it possible to easily perform tasks that were incredibly difficult, if not impossible, via scripting alone. Consequently, it’s important to have at least a working familiarity with WMI scripting—something you can keep in the bottom of your scripting toolkit if the need arises. And speaking of your scripting toolkit, the new tool I’m going to tell you about this month will soon become as indispensable as Notepad and XRay. It’s Scriptomatic. As much as I’d love to take credit for this little gem, I can’t. This treasure comes from the brilliant minds of Microsoft’s “The Scripting Guys.” Those of you who have heeded my advice in the past and visited Microsoft’s scripting Web site (msdn.microsoft.com/scripting) should already be familiar with these guys. They run the scripting clinic . However, they also run the “Script Center” on Microsoft’s TechNet Web site. This is where I found Scriptomatic. You can download it at www.microsoft.com/technet/scriptcenter/WMImatic.asp. Scriptomatic is deployed as a hypertext application. What this means is that it’s plain, old HTML with a file extension of .HTA. When you double-click on this file to start Scriptomatic, it loads the WMI classes and puts them into a nice drop-down list. 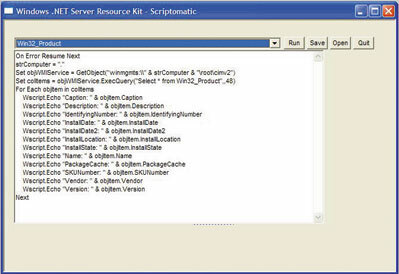 Figure 1 shows the main screen of Scriptomatic with the list box open. You select the class you want to work with, and your script magically appears! Well, sort of. Like all Microsoft wizards, it won’t do all the work for you. The scripts it creates are essentially scriptlets that handle making the appropriate connection, retrieving the associated properties, and echoing the data to the screen. Still, this is quite impressive. You’re then free to pick and choose from the generated code and place it into your script. Figure 1. The Scriptomatic can create a basic script for any WMI class. For coding additional script logic, all that’s required is for you to substitute the relevant “WScript.Echo” lines with suitable code, such as assigning the value to a variable or comparing it to another value (or both). Figure 2 shows the Scriptomatic window with the code generated from the Win32_Products class I’ve been using for the last few months. Figure 2. Scriptomatic’s code with the Win32_Products class added. You have got to hand it to The Scripting Guys. Not only did they create a tool that’s destined to become a staple in every self-respecting scripter’s tool kit, but the manner in which they created it leaves room for additional optimization. Because this is a hypertext application, you can open it in notepad (or any HTML editor) and actually see how the thing works! This provides valuable insight into hypertext applications in general, as well as giving you the ability to modify exactly how the scripts are created. The subroutine that actually composes the script consists of only 23 lines of code. The “WScript.Echo” statements as well as the moniker of the connection string are all hard-coded into the .HTA file. This can easily be changed (as mentioned previously) to automatically assign the value to a variable, perform a comparison, or any other number of operations. Finally, because a hypertext application is essentially a script that runs in an Internet Explorer window, you could (if you so desired) take the code from the .HTA file, modify it to suit your needs and save it as a regular script. The only thing you really give up is the basic interface and the drop-down list. Simply pass the selected class as an argument and configure it to save the script automatically to your scripts directory. At its heart, the Scriptomatic is a powerful script that allows you to determine what WMI classes are available, then enumerate all the properties and methods for each class. How cool is that? 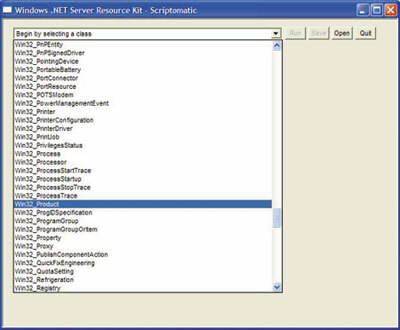 Scriptomatic should prove invaluable as you get more familiar with WMI scripting. (Although I still maintain that those who wish to fully understand WMI scripting pick up a suitable reference text.) And, of course, you’ll need to refer to this column monthly (whether or not the topic is WMI) just to be on the safe side (please forgive my shameless plug). Nevertheless, Scriptomatic will surely provide immeasurable value to you as you move forward. Just don’t forget: You saw it here first.